A simple pendulum is an idealized model consisting of a point mass suspended by a massless, unstretchable string. 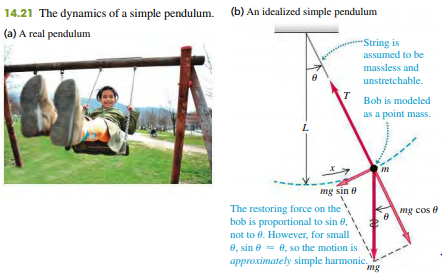 When the point mass is pulled to one side of its straight-down equilibrium position and released, it oscillates about the equilibrium position.Familiar situations such as a wrecking ball on a crane’s cable or a person on a swing (Fig. 14.21a) can be modeled as simple pendulums. The path of the point mass (sometimes called a pendulum bob) is not a straight line but the arc of a circle with radius L equal to the length of the string (Fig. 14.21b). We use as our coordinate the distance x measured along the arc. 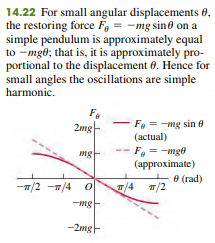 If the motion is simple harmonic, the restoring force must be directly proportional to x or (because x = Lu) to u. Is it? These expressions don’t involve the mass of the particle. That’s because the gravitational restoring force is proportional to m, so the mass appears on both sides of gF S = ma S and cancels out. (The same physics explains why bodies of different masses fall with the same acceleration in a vacuum.) For small oscillations, the period of a pendulum for a given value of g is determined entirely by its length. Equations (14.32) through (14.34) tell us that a long pendulum (large L) has a longer period than a shorter one. Increasing g increases the restoring force, causing the frequency to increase and the period to decrease. A pendulum is a useful timekeeper because the period is very nearly independent of amplitude, provided that the amplitude is small. Thus, as a pendulum clock runs down and the amplitude of the swings decreases a little, the clock still keeps very nearly correct time.